Image courtesy of At $.71 each for just the container, Whole Foods made $4.26 (not including the accidental empty), and he was charged sales tax on all but two of these. 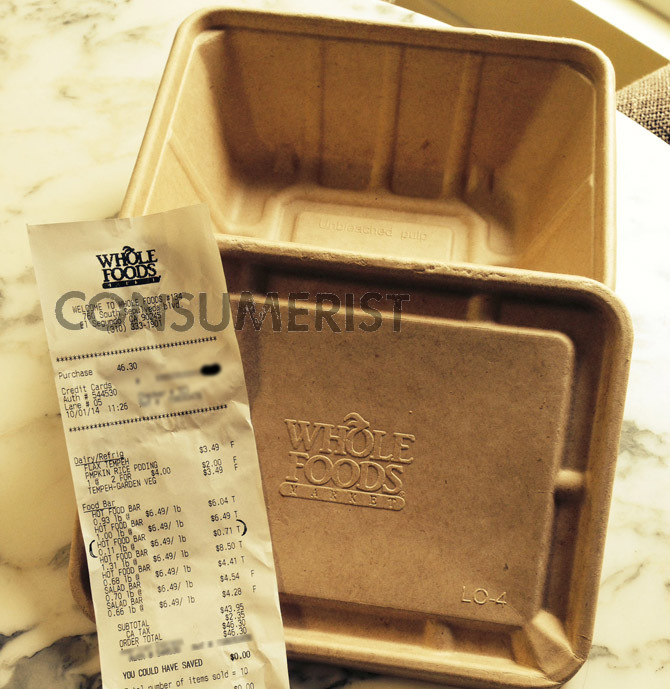 According to Michael, he was charged $.71 plus tax for this empty container at an L.A.-area Whole Foods. Only a few months ago, Whole Foods agreed to pay $800,000 to close a one-year probe by prosecutors in three different Southern California cities into allegations that the pricey supermarket was overcharging customers even more by, among other things, failing to deduct the weight of containers when ringing up charges for self-serve foods. Whole Foods promised to stop the practice and right its wrongs, but one Consumerist reader believes the company isn’t doing what it’s supposed to. Michael recently went to a Whole Foods in Los Angeles County and bought a bunch of items from the hot food and salad bars. In his rush to get in and get out, neither he nor the cashier noticed that one of the seven opaque paperboard containers he brought to the checkout was still empty. At $.71 each for just the container, Whole Foods made $4.26 (not including the accidental empty), and he was charged sales tax on all but two of these. The receipt states the one container weighed .11 lbs, which seems to be in line with the empty weight of some similar box/lid combinations we found available from wholesalers. At $6.49/pound, that comes out to $.71. 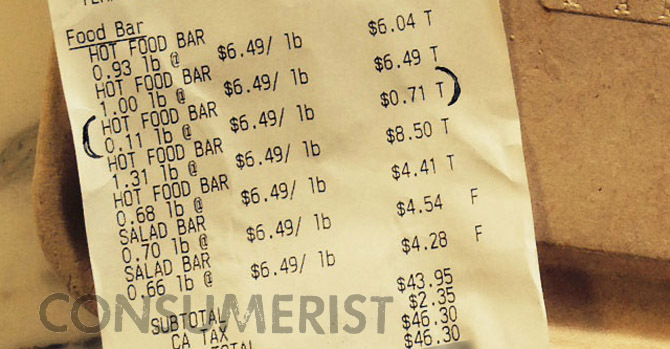 If that’s true, then even if Michael hadn’t accidentally brought the empty container to checkout, he’d have still been charged around $4.26 (plus tax) for the others that he remembered to put food in. And he’s lucky that he just happened to go on a Wednesday, when the hot food bar price was reduced from its usual $8.49/lb. At that higher price, he’d have been charged around $.93 plus tax for these containers. We reached out to the office of L.A. City Attorney Mike Feuer, who investigated the Whole Foods allegations with the City Attorneys for San Diego and Santa Monica. A rep for Feuer confirmed that the injunction against overcharging is statewide in California, and any consumer who believes they have been overcharged should file a complaint with either the California Division of Measurement Standards, or the local weights and measures officials in their county. The state office has this list of links to each county’s relevant department. In Michael’s case, he would want to file a complaint with the L.A. County Commissioner of Weights and Measures. We also contacted reps for Whole Foods’ regional and national office but have not received any reply as of this morning.